Gene Black an Alabama Artist and Quilter: Clean is Good! If you are looking for my post on the Patsy Thompson blog hop, it is here. I love taking a nice hot shower. I love being all clean and fresh. I don't like it when the soap I use dries out my skin though. I love chemistry too. When I was younger I begged relentlessly for a chemistry set. I think someone finally told my parents that I could not blow up the house with it. So for Christmas that year I got a ChemCraft chemistry set. This is not the exact one I got, but I could not find a picture of it. As I remember mine was in a metal case with three sections. I loved doing the experiments included in the instruction booklet. I was rather sad when I used up the chemicals and couldn't replace them. Several (maybe 15-20) years ago, I got a bar of handmade soap from a gift basket that was won at a Christmas party. I fell in love with that soap. Besides making me feel clean, it made my skin feel better. I checked with the store that had donated the basket. I was shocked at the price for one bar of soap. Since I have always enjoyed shopping for a deal, and I had just realized that internet shopping yielded some amazing bargains, I decided to try to find it cheaper online. That began my soapmaking adventures. Sadly due to the manufacture of illegal drugs, one of the common products is now much harder to find. That product is essential to making real soap. You must have real, pure lye (also known as Sodium Hydroxide.) The lye is combined with an acid that is quite common in most kitchens although you may not realize it is indeed an acid. That acid is cooking oil. I have used everything from lard to coconut oil (along with many others) in making soap. The current batch is made with canola oil and coconut oil. Each oil has properties that make a difference in the soap. Some oils make rich lather, some make it gentler to the skin. The canola gives a stable lather, conditioning factor and makes a softer soap. Coconut oil helps to make the bar harder and makes the lather fluffier. Too much coconut oil in the soap can make it drying to the skin though. I always get my molds ready before I start and put them on an old towel. There is one mold in this picture that I did not use. It was a "just in case I need it" mold. 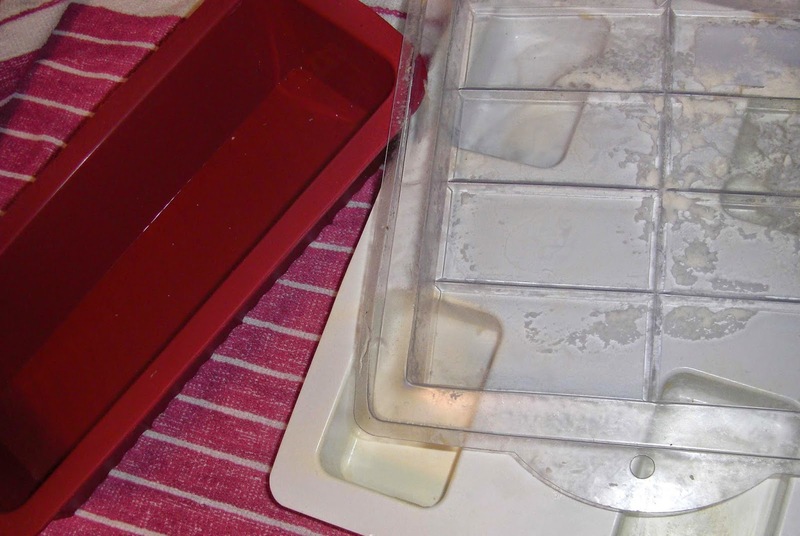 I actually used the clear mold and the red silicone loaf pan. Prior to starting everything is weighed carefully on a postal scale. This ensures that the resulting soap is mild and skin friendly. So, to make soap, the lye is put in the water (always the lye goes into the water - the other way can cause it to erupt like a volcano!) The lye and water create an exothermic reaction (It gets HOT!) The oil is heated. Then both the oil and lye-water are allowed to cool to roughly 110-120 degrees. The lye water goes into the oil. Then it is stirred for a while. I use both a silicone spatula and an immersion blender for this. The color changes to a creamy warm off white. If it is stirred only by hand it can take hours! The immersion blender speeds the process greatly. When the mixture reaches what is called "trace" it is time to add any fragrance oils. 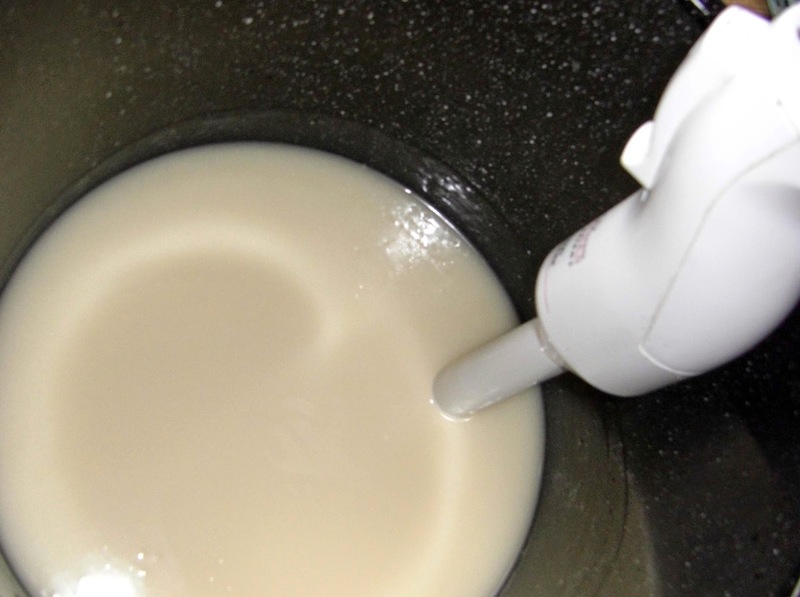 Trace is when the spool or immersion blender leaves a line in the mixture. Or if you scoop up a bit and drop it it doesn't immediately blend back in but is visibly laying on the surface. 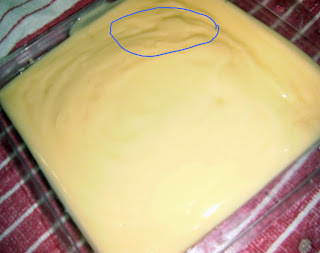 While the above picture is after being poured into a mold you can see that it did not level out..the part circled in blue shows what "trace" looks like. After adding the fragrance oils (if any) the mixture is stirred just enough to incorporate the fragrance oils into the batch. Then it is poured quickly into the waiting molds. If you notice at the lower right there is a spot of soap mixture that got on the towel. It is much easier to wash the towel than to clean the surface. For cleanup, I add a little water to my soap pot and try to stir all the leftover into the water. I do not put my hands into it as raw soap is still harsh and will dry out skin. Then I take it outside and pour it in the weediest part of the yard. (it doesn't seem to hurt it, but I figure if it kills anything hopefully it will be some weeds!) Then I wash up all of my soap making equipment. I never use that equipment for anything else. The soap has to cure for at least 24 hours in a warm place before it is unmolded. 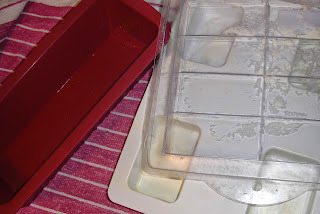 I usually put a thick towel on top of the washing machine, set the filled molds on it, cover it with a box to keep anything off the surface of the soap and then cover the whole thing with a thick towel to insulate it. The soap goes through a gel phase and gets hot again. Preserving that heat helps it to process. After unmolding, I will slice the soap into bars and put it on a rack to dry and finish curing. That will take four to six weeks. This is not a quick process. But for me, the resulting soap is worth the effort. 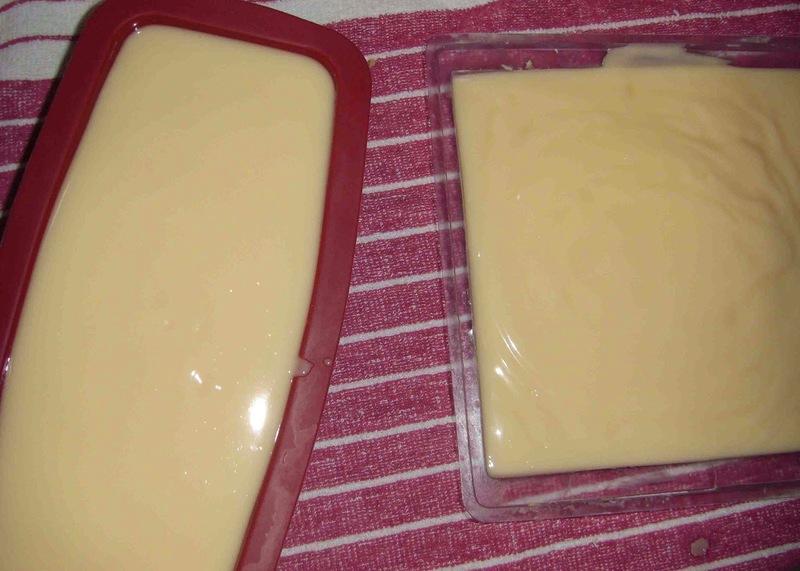 Now if you are still curious and want to read much MUCH more about making soap, here is the page where I learned to make soap: Miller's Homemade Soap Pages. Great post! I too have discovered the advantages of making my own soap. Like you, I use the cold process method, and I love using silicone molds. I pick them up everywhere I see them, often in baking supply aisles. I just put a batch of unmolded " cupcakes" aside for curing. The fragrance is appropriately chocolate, and they smell good enough to eat! That is so cool that you are making soap Gene. Thanks for the information and the web link! Very interesting. I've never made soaps, but I do agree a good bar of handmade soap can be so much nicer than commercial soap. Awesome! I have always wanted to try making soap, but since I have very inquisitive little ones I will have to wait until they are older.